The Stillwaters campus has short trails, a pond and a native plant nursery. In the future we will have an interpretive center, a library, and classroom and lab spaces. Discovery Packs are available to rent during business hours and by appointment on weekends and holidays. They include tools, field guides, and games designed to promote enjoyment of the outdoors for adults and children. There is a $5 rental fee. Call or email to reserve your pack! The annual Stillwaters' Used Book Sale is only in September/October. BUT! You can shop for our finer books online, all year round at ABEBooks! There are books of all kinds there. And, if you are local, you are more than welcome to pick them up here at Stillwaters and even come and browse during business hours. Click HERE to browse our online books for sale. 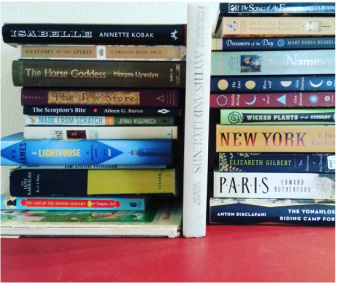 If you are interested in donating books, we accept them all year long. Contact us for more information or simply leave them on the porch of the "treehouse" - the first building on the left as you proceed down the driveway. If you have a large amount, such as an estate, sometimes, arrangements can be made for us to pick them up. Unfortunately, we cannot accept encyclopedias, Readers Digest, or magazines. Stillwaters is located in the Carpenter Creek watershed in the lovely town of Kingston, Washington on the Kitsap Peninsula. The eight acres on which it sits are valued for environmental, aesthetic and educational benefits. Stillwaters is a non-profit 501c3 organization and all donations are tax-deductible.